Most items in this catalog are available in stock. Other items can be ordered upon request. To see more products from this collection please go to Collections tab and click Armani Xavira. Please contact us to get more information. 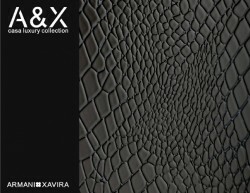 Exhibiting sophistication, elegance and finesse, the A&X Casa Luxury Collection shines with refinement. This exclusive and luxurious line offers beautiful works of art designed with quality materials and skilled craftsmanship. Become enchanted with the signature laser-cut crocodile texture created with a meticulous twelve-step process to perfect the detailed pattern. Each piece is polished with a saturated gloss lacquer finish to attain a lustrous sheen.